If you are like me - a drummer - you probably spend a lot of your time tapping things to hear what they sound like. Well, here's a chance to do that on a grand scale, on drums from very different traditions. Ive deliberately chosen these styles because of their unique approaches, and to avoid the usual Djembe / Afro-Cuban / Samba styles which I think are well covered elsewhere. 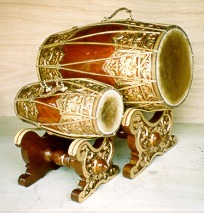 Dhol drums are said to have their origin as war drums in 15th Century Northern India - the Punjab. 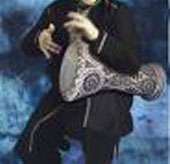 Nowadays they feature in folk music from that region, but most people probably experience them as part of Bhangra, the Asian - Urban - Bollywood fusion. They are also used alot in wedding bands and other celebrations. 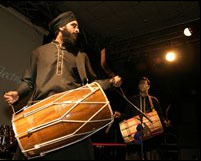 The drums are traditionally barrel shaped, but modern dhol are often straight bodied. They are double headed, one deeper tone - often animal skin, played with a thick, curved 'dagga', and a higher tone, now often plastic, played with a thin cane 'thili'. - in the same way as the Tupan. Though the drums can be large - up to 4 feet, they are worn slung round the neck so that they can be played standing or marching. The theatrical presentation often involves dance movements as well. As befits their bellicose beginnings and use outdoors, they are LOUD. The group facilitating our sessions is Dhol Drummers who play and teach all over the UK. This form of music developed in Indonesia, via India, with regional varieties in Java and Bali. It is a group form, originally often based around a single village. 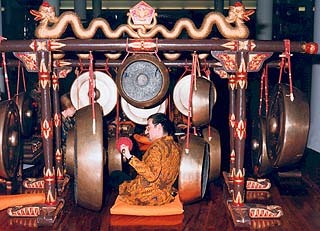 The name Gamelan refers to the whole instrument, consisting of a number of metallophones, manufactured as a unique matching set, including gongs as well as xylophone type instruments. 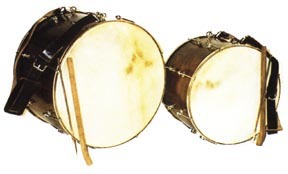 The drums are double-ended and come in a set of three sizes. What interest me are the techniques of playing, which involve producing a variety of sounds by 'damping' one head whilst striking the other, plus the role of drums in Gamelan which is one of direction and punctuation, leading the group through compositions which have sequences which are definite, but not fixed in duration, and also involve changes of tempo. 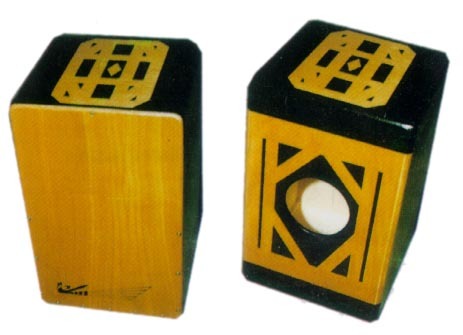 The mettalophones use a variety of interesting techniques involving damping the bars as you play, and imbal - roughly meaning playing the off beat or echoing. Our session will be facilitated by the London Symphony Orchestra Gamelan, probably the longest established UK Gamelan, and will take place at their premises at the Royal Festival Hall. 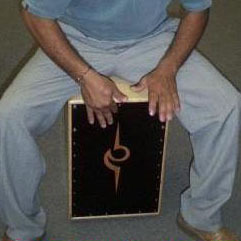 The modern Cajon was developed in Peru, and spread to be used in Flamenco and other Latin forms. It was originally a simple packing case that indentured or slave workers in colonial times would use to accompany their singing. Because their colonial masters would ban the use of drums to try and suppress their workforces culture, and therefore their freedom, the instrument has acquired a certain political significance as symbol of struggle against oppression. As its origins would suggest, the Cajon is essentially a box. The player sits on it, and produces a variety of tones by striking the surface in different places. The modern Cajon though is highly developed and uses a variety of materials to enhance the sound, using bass 'ports' (like sub bass units in stereo systems) to boost the low register, and often now feature 'snares' (like a snare drum) to elicit crisp high tones. There are advanced techniques which involve players using their heels to vary the pitch of the bass tone. The interest for me is the immediacy of access, its simplicity, and its ability to act as the drum kit in a band. 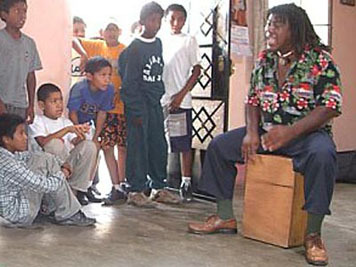 The music of Peru incorporates Latin and Western influences, but crucially retains links with the traditions of the indigenous Indians, especially in the use of unusual compound times. Our facilitator is Kieffer Santander who has been playing and teaching in the UK for many years, and is part of the Manos Negras group, prominent in the UK Peruvian scene. I am using the Balkans to illustrate styles of drumming that are ubiquitous all over North Africa, the Middle East and Eastern Europe - i.e. the old Ottoman Empire - and it's a big part of Gypsy music. Bands in the tradition tend to only have one or two drums with a number of string and wind instruments, as well as varieties of accordions. 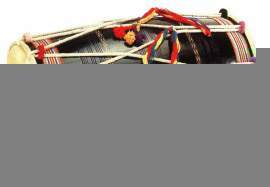 There are two types of drum used, one, the Tupan, is like a concert or brass band bass drum, worn on a strap in a processional style. It has a higher pitched head played with a thin stick, and a deeper head played with a beater, and often has a small mounted cymbal. The other drums are goblet drums - vase shaped - which can produce an astonishing variety of sounds - bass tones, slaps, pops and high speed rolls. 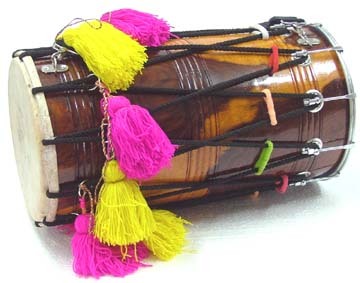 They come in variety of sizes with a variety of names - Darabuka, Doumbek, Tonbak, Tabla, Dhol etc etc. 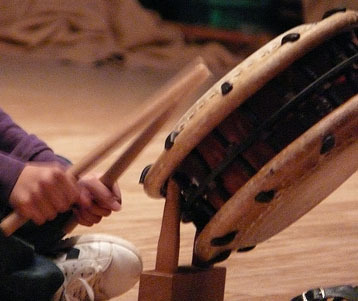 The two aspects that interest me are firstly the technique on instruments like Darabuka - including using fingers as well as whole hand strikes, and the way the drums are held. Secondly, for West Europeans, the way melodic content is structured and the common use of 'odd' time signatures - 5/4, 7/8, 9/8 and so on - make the music exotic and fascinating. 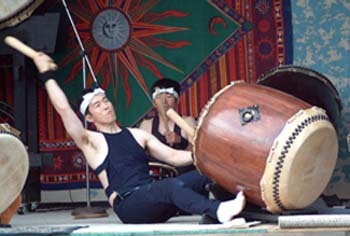 Taiko (meaning 'drum') developed in Japan via India and Korea. 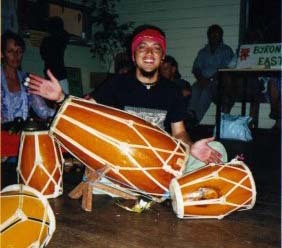 It is a group form, using a number of different sized drums. The use of the very largest drums (O-daiko, sometimes known as thunder drums) came out of competition between warlords - they were used to rally troops and to establish territorial dominance by being louder, so covering wider areas. As a contrast to the drums, melodic instruments tend to be flutes. What interests me about this style is the attack, precision and huge dynamic range employed. It can be physically demanding- members of groups such as Kodo (possibly the most well known group in the West) have to run a half marathon every day as part of their training. Playing stances are often standing, and require large physical movements which form part of the theatrical presentation. Even the sticks are super sized, like cut down broom handles. Compositions often incorporate arrangements or physical movement of performers to create spatial effects in performance. The group facilitating our sessions is Taiko Meantime, and our session will take place at their premises in Greenwich. They formed in 2001 and have performed at Southbank Centre in London, on BBC and Channel4, and alongside the world-class Hana Yui (of Kodo).